That´s the bottom left cormer of the largest possible map (a scenario created by my own). There are only Gardens around this area. Why i cannot fill up theese road-fields with plazas? I don't know why either, it's probably a bug. Does it work if you replace the gardens with statues? Oh-oh, me uninformed opium is you edited the Pharaoh_Model_....txt Gardens longness to 6 from 3.
i thnk, that only grows the area, where the positive desirability-effect is active. in my other missions i have no problem with that. So my next guess is you placed 'killer spawn' or 'prey spawn' flags in the area; cannot tell what overlay was used for the screen capture. PS: I have been nerly sleepless with this issue as my dreams are plaged with it. I've just re-read this carefully. Maybe user3 is onto something. Is this right against the edge of the map? Could be Kingdom Road entrance and exit tiles, plus 2 invasion points. I don't know if the straight line like that lines up with edge of the map spawn points though. My question would be, when you hover your mouse over the road tile while trying to place the plaza, is it green or red? Red would indicate there isn't enough desirability to upgrade, green means there is enough desirability but there is some bug such as a spawn point under the road that stops it visibly showing up. it is red, but there is nothing, that can lover desirability there. I changed the txt-file to make all buildings have the same desirability vaules like the highest i found in that list (i think, that was temple complex). And i set the damage and fire risks on 0 to neet no fire-fighters and architects. In my other missions that worked well. 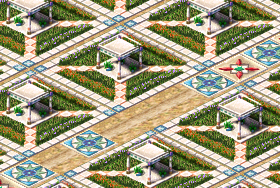 That explains it, assuming that you also changed the non-building items, such as gardens and plazas, to have that extremely high desirability effect. Desirability is stored in 8 bits in two's complement notation. In other words, a desirability value that is calculated as 200 is stored as -56 and a desirability value that is calculated as 300 is stored as 44.